The probabilities are estimated first by using the normal distribution function (the default) and then by using the logistic distribution function. Note that, in this model specification, the natural rate is assumed to be zero. The LACKFIT option specifies lack-of-fit tests and the INVERSECL option specifies inverse confidence limits. In the DATA step that reads the data, a number of observations are generated that have a missing value for the response. Although the PROBIT procedure does not use the observations with the missing values to fit the model, it does give predicted values for all nonmissing sets of independent variables. These data points fill in the plot of fitted and observed values in the logistic model displayed in Output 75.1.7. The plot, requested with the PLOT=PREDPPLOT option, displays the estimated logistic cumulative distribution function and the observed response rates. The p-values in the goodness-of-fit table of 0.6009 for the Pearson’s chi-square and 0.4616 for the likelihood ratio chi-square indicate an adequate fit for the model fit with the normal distribution. Tolerance distribution parameter estimates for the normal distribution indicate a mean tolerance for the population of 0.5303. Output 75.1.2 displays probit analysis with the logarithm of dose levels. The LD50 (ED50 for log dose) is 0.5303, the dose corresponding to a probability of 0.5. This is the same as the mean tolerance for the normal distribution. Output 75.1.3 displays probit analysis with dose levels. 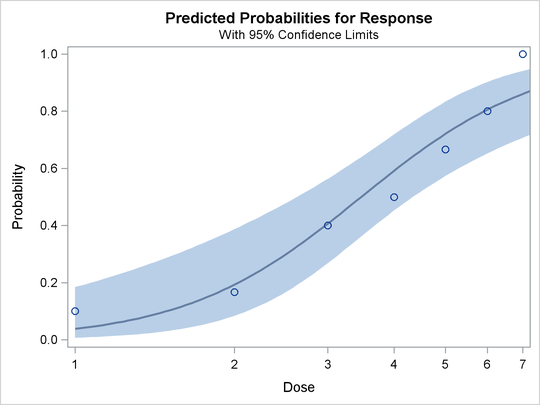 The ED50 for dose is 3.39 with a 95% confidence interval of (2.61, 4.27). The regression parameter estimates in Output 75.1.4 for the logistic model of –3.22 and 5.97 are approximately times as large as those for the normal model. Output 75.1.5 and Output 75.1.6 show that both the ED50 and the LD50 are similar to those for the normal model. The PLOT=PREDPPLOT option together with the ODS GRAPHICS statement creates the plot of observed and fitted probabilities in Output 75.1.7. The dashed line represent pointwise confidence bands for the probabilities.